If you want something done right, do it yourself. Thanks to Wix and Weebly, this also applies to websites. Both website builders are incredibly easy-to-use and feature-rich publishing platforms that have become synonyms for DIY website creation. Because the two builders are extremely popular and seem very similar in their offerings (at first glance), many potential users face the dilemma of choosing the right one. To help them make an informed decision, I have tested the two platforms, analyzed user feedback and looked through dozens of Wix examples and Weebly powered websites. As a result I’ve tested the ease of use Weebly and Wix from the newbie’s point of view, looked at their features and flexibility, compared their pricing policy and support service. I was trying to make this comparison as practical and unbiased as possible. If your opinion differs from mine, please leave your valuable remarks in the comments. And now let’s go to the comparison! Wix. Wix is almost a universal website builder with a visual editor. It is one of the most powerful platforms in its niche due to its flexible design customization settings and rich app store. This complex of features allows creating lots of website types, namely classic websites, landing pages, online stores, blogs and even forums. There is only one restriction here: just like in any other WYSIWYG system, it’s not quite easy to create large websites here, which is quite understandable. That is why, Wix appeals to many users willing to launch business or PR projects of any specialization. It makes it possible to create stunning promo websites, portfolios, business websites, small online stores and blogs with impressive design. Wix is popular with representatives of creative professions, who wish to present their art works in the most decent and creative way. Photographers, musicians, artists, journalists, writers, designers and fashion specialists constitute the most devoted platform audience. This is due to the versatility of high quality templates and convenient customization. The system will especially be interesting to business owners because of its simplicity and convenience of website creation. Price lists, charts, forms, banners, website registration access – all these features make it possible to create an effective business website. Weebly. Weebly is also very intuitive. Its interface is less flashy, yet highly effective. The editor is well organized. Similar to Wix, Weebly has a very well structured dashboard. From changing your account password to sending invitations* to your friends, everything can be done with just a few clicks. *For each friend who signs up and publishes a website on Weebly, they’ll give you both $10. Wix vs Weebly. Both website builders are a joy to behold. Their control panels are divided into two logical areas: Dashboard and Editor. This makes it easy to effectively manage multiple websites from one account. It’s important to note that Wix supports full drag-and-drop, meaning you can drop the chosen object anywhere on the canvas. Weebly also offers drag-and-drop, yet it is somewhat restricted – all elements fall to specific containers (that make up your Weebly template), and you can’t move draggable objects around the page with pixel accuracy, like in Wix. Wix’s approach is called ‘absolute positioning’ and what seems to be a benefit at first glance, in the long run can cause many inconveniences. For instance, Wix users can’t switch templates. Weebly’s approach is known as a ‘box model’. It’s more restrictive, yet it allows users to change templates in the future. On one hand, Wix seems to give more creative freedom, on the other hand – Weebly tries to keep everything (including the generated code) cleaner. By restricting the drag-and-drop areas they prevent user errors. So which one is more convenient: Wix or Weebly? It depends on what you expect to get: the full visual control over the site’s layout or the ability to switch templates in the future. Note:What can’t be done via Weebly’s visual interface, can be implemented through its advanced HTML/CSS editor (for experienced users only). Wix. Recent updates have brought the platform to the brand new level. The system editor looks quite rich. It is clear, user-friendly and appealing. It makes it possible to edit standard and mobile website versions separately. Visual editor used in the system is quite impressive and functional, but it’s also a bit slow. A user needs to get used to it as well. It’s difficult to call it complicated as well as simple. It is a bit overloaded with options. You’ll have to practice a bit to bring your ideas into life. This is especially true for newbies. Generally, the dashboard is quite convenient and appealing. It’s pleasant to work in it. Each block or widget has lots of settings. It’s possible to modify the structure as you need, but sometimes it becomes hindering, especially if you start working with layers. You have to be careful not to get confused by the style and get an odd result. The system does not correct user’s faults. There is no auto fit here. You’ll have to rely on your personal estimations and the scale. By the way, it is impossible to change the initial block structure and position in the templates. What you can do is to extend their boundaries and that’s it. Apart from adding and setting up the elements, you can edit each block and widget after you select and adjust its position. There are lots of options here. You can replace the blocks with widgets as you wish, change their backgrounds, content layout, sizes, frames, add display animations etc. Generally, Wix works great, when it comes to customization and feature set. You can add videos from popular hostings to your website, create SoundCloud playlists, set up comments through impressive galleries, images in which can be modified in the surrounding similar to that of Photoshop. Generally, Wix has impressive options to realize creative approach to website development. 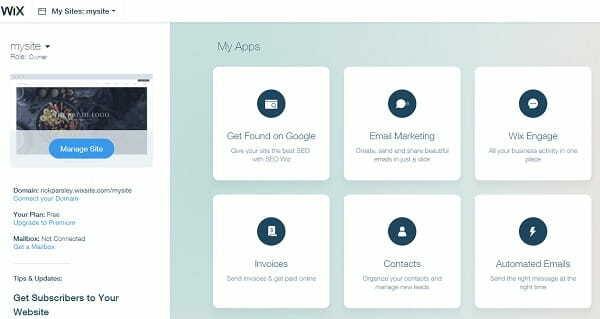 There is, probably, no other system, which can be a decent competitor to this website builder. If you wish, you can protect your website pages with a password or hide them at all, offering access to the user categories you have initially selected or providing a link to this web page. There is also a simple, but conveniently realized option of adding website co-authors: with just a few clicks, you can add website editors, who will be allowed to make secondary changes, but they won’t be able to spoil anything, even if they wish to. Generally, it’s very easy to select a team to fill your website with content at Wix. This is organized in a convenient and safe way. It’s also very convenient to edit text in Wix. The system editor allows formatting articles in an appealing way, adding any elements to them, including animations, charts, diagrams, videos, photos, lists etc. The platform creates an impression of a powerful and quite easy to use toy. Yes, the process of creating a website with Wix resembles an exciting and bright game. The show window of an online store has created positive impression as well. It looks like Wix is now ready to become a decent tool for sellers. You will hardly create a large trading platform with the system, but it can certainly become a nice tool for launching a small/medium online store. Obviously, it’s possible to set up SEO parameters, website boundaries, set up favicon and web page redirects here. There is a “?” icon above each block, which grants quick access to the element’s FAQ. This is very convenient and you won’t get lost here. 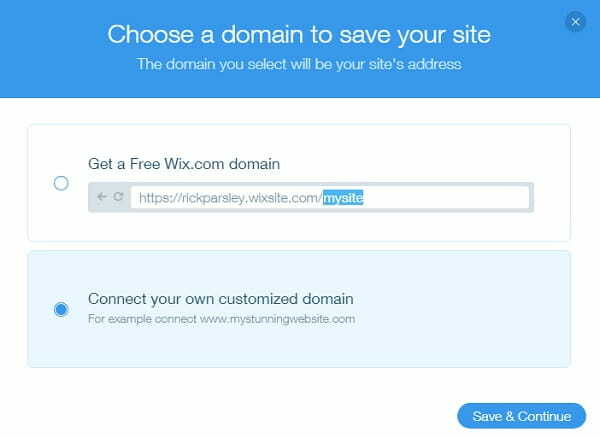 You will also get a domain like username.wix-dot-com/yourwebsite by default, when using a free plan. It’s obvious that nobody needs such a domain name for longer than a week. This is when you will face a notable Wix feature, which characterizes the platform as a paid website builder. You’ll have to upgrade to the paid plan to set up a normal domain name. The system makes it possible to use the features absolutely for free, but with very serious restrictions. The major of them is the absence of an opportunity to set up an individual domain name. This is what completely destroys the allure of Wix Free account. You can use a free plan to explore and test the platform, but you will still have to upgrade to the premium plan to develop a serious website. Another option to do that is to choose another website builder. Apart from that, Wix editor supports the combination of hot buttons, which makes the process of working with it similar to that of Photoshop and other graphic editors. Lots of options are available here, such as copying/pasting/canceling/deleting/placing to the front or background, choosing the next element etc. Having practiced a bit, you will be able to surf the dashboard and fulfill the tasks in a quick and distinct way. The service also has a couple of tricks up its sleeve. Wix ADI (Artificial Design Intelligence) is one of them. This is the integrated system used for automatic website creation (structure, design, content) based on the initial data provided by a user. Thus, you can use this smart tool instead of choosing a template, editing it and setting up your website. This is an alternative option for those, who don’t understand anything about website building and consider the choice of a template too complicated. To use the tool successfully, you need to provide your business name, its geographic location, niche and select the required functionality (online store, blog). Wix ADI is the first world-known technological platform, which comprises website design and content creation with artificial intelligence. This allows creating full-featured websites in less than no time. This tool allows small enterprises to create website pages in a simpler and quicker way than any time before, eliminating the necessity to know coding nuances, website structure or design. Everything a website owner will have to do is to answer several questions about the company and select design options. Right after that, you will be offered several questions that help ensure better result and the system will automatically generate your website using the data available in the global network and algorithm based on the statistic data found in the client website base. If your business is available in the social networks, you will additionally get content. This variant may look half-done. You’ll have to add more content (the tool doesn’t write articles for you) and, maybe, change the design a bit by using the features of a standard system editor. This is still a short way. We have tried it – the result looks surprisingly decent. The second highlight of the system is Wix Code. This is a powerful tool used to create different types of complicated web applications in a quick and easy way. Regardless of the obvious name implication, coding knowledge is not a must to use the feature. We don’t deal with text editors and compiler here, but with the interface that allows organizing logical connections leading to the completion of different actions and collecting them in one working application for your website. In other words, we talk about the constructor of web apps. For example, it’s possible to create a database with any content and add it to the web pages instead of manually organizing the content each time you need this app. You can also create new effects for your website and integrate them into the available elements. 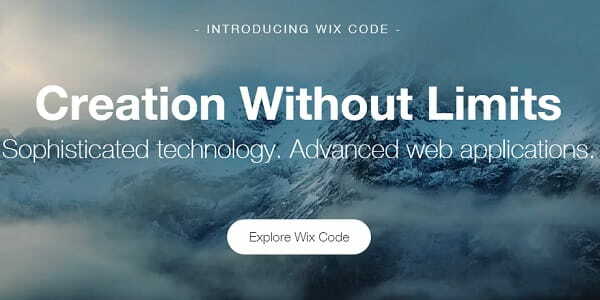 Wix offers API to coders, which allows creating individual components for websites of any type. Generally, these features notably expand the feature set of the system, eliminating almost all the extended frames of Wix visual editor. Almost any person can use the feature set of the website builder. No special skills are needed here, except for patience and a bit of taste. It’s pleasant and interesting to use the tools the system offers and there is definitely much to test here. The result looks pretty impressive as well, but only if you approach the process with attention. Yes, you can’t edit a code here, but the system still offers lots of appealing and functional features. However, you’ll need time to master them properly. This may seem complicated because of their amount, but not because of the complexity of use or interface. To get a detailed impression about the feature set of the system, we recommend browsing through its blog, FAQ and sections focusing on the creation of separate website types. You’ll unveil new options here and will be inspired by them. 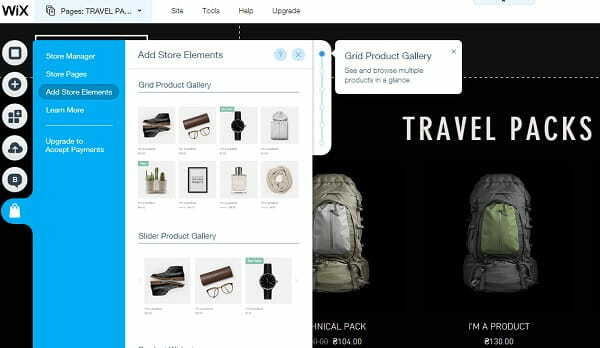 Wix eCommerce features: multiple payment options, the ability to generate promotional coupons, customizable tax and shipping rules, mobile commerce and more. Check out real Wix-based stores. Wix Blog features: the ability to schedule posts and add authors, multiple commenting systems, password-protected blog posts, the blog archive and more. See what real Wix blogs look like. Mobile optimization. Wix offers a built-in mobile editor that allows users to fine tune the mobile look of their sites using the same drag-and-drop tools. You can resize, relocate, hide and show any elements. You can re-show hidden elements anytime. Editing your mobile view does not affect your desktop site. Additionally, you can configure the Mobile Action Bar. Wix Forum. There is also one more important feature Wix is known for. 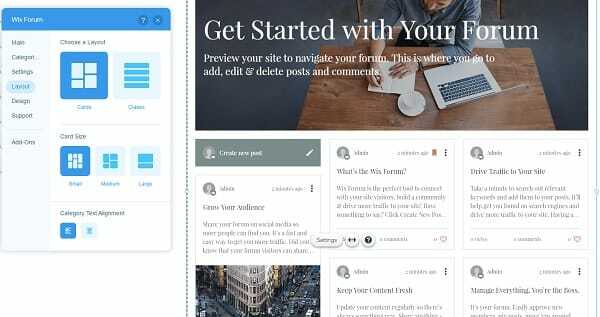 The system makes it possible to connect a forum to your website and update it as often as you need. This is done by means of selecting and adding Wix Forum widget, which is available in the App Market. The tool is absolutely free, irrespective of the plan you will go for. Installing it doesn’t take much effort and time – the process is quick, easy and understandable for all users. Wix Forum offers multiple advantages, namely an opportunity to subscribe to other users, enable the commenting option, post, update, schedule and remove publications, integrate video and photo files. What you will eventually get is a full-featured forum community, where you will be able to create and manage topics, new threads and categories to stay in touch with the target audience. Weebly. Having had a quick overview of the system options, I‘m sure now that the initial positive impression of the system will keep growing. I was offered to select the website type – a promo website, a blog or an online store. I’ve chosen the last variant because of the desire to test the entire feature set of the system. I’ve seen everything I supposed and even more. It seems that Wix is not the only website builder, which can boast flexibility and lots of options. This is where you can find everything you might need when working at your website development. The dashboard structure is logical and simple. The design is appealing. All the options are grouped into five horizontal menu sections, namely “Create”, “Design”, “Pages”, “Online Store”, “Parameters”. Weebly feature set is exhaustive. There is almost nothing you can add here. Everything is based on the drag-and-drop functionality. In this respect, the system works great as well – it is convenient, powerful and appealing. Domain names: The service offers almost the same features as the majority of its niche competitors. You will get a 3rd level domain like creative.weebly.com by default. There is also an opportunity to buy a domain name in .org, .net, .com zones. You can purchase it directly in the website builder or use the domain name bought from the external register. It’s not a problem. Weebly eCommerce features: mobile checkout, filtered product search, the ability to sell digital downloads and physical goods, inventory management, and coupon codes, among other features. Take a look at functioning Weebly stores. Weebly Blog features: scheduled posts, multiple commenting systems, the ability to add custom header and footer code for individual posts. Here are some Weebly-powered blogs. Mobile optimization: Weebly also provides a mobile optimization solution. However, it only works with old, non-responsive templates that require manual mobile optimization. For my test website I chose a new, responsive template, and when I entered the Mobile Editor, I couldn’t change the mobile view. For responsive themes, Weebly provides ready mobile solutions. With Weebly you can add multiple contributors to your website (Account admin, Author, Dashboard only). The latter two types are available for Pro users only. Wix doesn’t support this feature. In other words, if you decide to provide access to your Wix site’s control panel, the only way to do that is to share your own credentials. Weebly partners with IFTTT to help you automate many actions related to your website. You can choose a ready ‘recipe’ or create your own to automate a custom action. Example: uploading a new video to your YouTube account will automatically create and publish a blog post on your Weebly site. 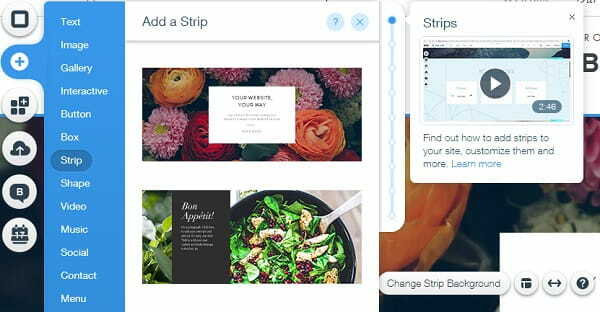 Weebly had long-lasting partnership with Square, which finally resulted in the merge of two companies. Weebly&Square have one common goal: to help the world’s known entrepreneurs succeed in their endeavours via building professional websites and supporting powerful offline ventures. This is going to make Weebly-based websites even more functional than before. Weebly vs. Wix. Both website builders offer impressive feature sets, and it’s really difficult to compare them, because it seems both offer more than enough to build a decent website. My advice is to focus on the native features of the builders. For example, if my site’s core functionality can only be implemented with a third-party application in Wix, I will choose Weebly, if it offers this feature within its native platform. Why? Because third-party providers can stop updating their apps one day. If something goes wrong with the app, you’ll have to contact the app’s developer, not your site builder’s support. Both Wix and Weebly offer user management systems and member areas. Wix. If you analyze a website based on the template quality aspect only, then Wix will definitely be the leader. 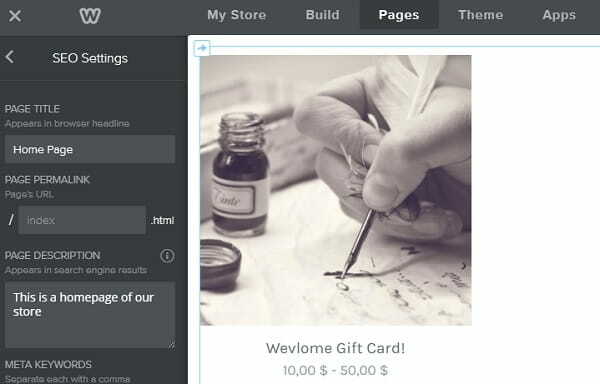 There are also other services with a rich amount of stunning themes, but Wix offers much more options, the quality of which is much better than anywhere else. This is not an ad, but this is the way the things are. When it comes to this very parameter, Wix doesn’t have any competitors at all. Ready made templates impress anyone by their versatility and quality. Users have the desire to look at them over and over again, which does not happen often. Apart from that, the templates are well-structured and subdivided into categories. This subdivision is based not only on the niche aspect, but on the types of websites the themes work best for. New and popular templates are singled out into separate groups as well. There are also blank templates for users, who might have the desire to build a website from scratch. It’s worth mentioning that the system frequently offers template updates. All of them have responsive design and are free to use. The only notable drawback is that you won’t be able to change the template you have initially selected. So, take your time to make a smart choice. Fortunately, the system has a preview option. So, you will see what you are going to choose. 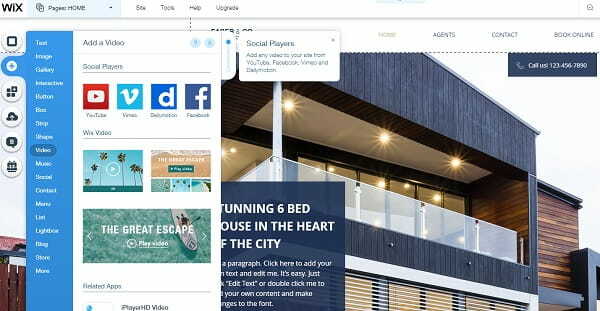 Wix website design depends a lot upon the settings and positions of widgets. Even the galleries are organized in the unique way here. Wix Gallery Pro is a free app, which is one of the system’s highlights. You’ll be able to create photo and video galleries of any format, set up the effects, post photos from your website in popular social networks etc. Generally, Wix places notable emphasis on working with graphics. You’ll be able to create a stunning design of your website. Parallax effect matters a lot here as well. Apart from its standard variation (front images and backgrounds move with diverse speed when scrolling), you can use other effects, such as enlargement, opening and display. It’s better, of course, not to use all of them at once – choose something you currently need and use it. No one likes websites, which are too eye-striking. Wix comes with a rich set of subtle options, which can help enhance your web page design. For example, there are cinemagraphs here, which are a combination of a standard photo and video. Some of the elements move slowly here and this creates a much better impression than GIF images. Such element looks great on a certain background. You can choose the required cinemagraph in a large Wix gallery. Internal slide shows impress everyone by the amount of formats and settings, making it possible to present anything in the most favorable light. You can also use sections to advertise your products, present something or display positive reviews. This is a nice way to highlight and organize content. There is an opportunity to upload your own fonts in any language. Apart from that, you’ll be able to work on the mobile version of your website. You can even set up the design of the mobile menu – color, text, measures, distance between the names of the points. Yes, a part of designs is responsive here. However, it is still better to control the display format of your website on different mobile devices on your own. You will eventually be able to notably change your stock template with regard to your needs. You won’t face problems with your website uniqueness. Wix has more to offer you in this respect than any other website builder with a visual editor. Weebly. When you look at Weebly templates for the first time, you certainly get confused. The impression is similar to that created by Wix. You won’t be able to make a quick choice as you’ll have the desire to see many of them. The templates are also grouped based on their styles and colors. You can choose the color scheme to meet a certain template. There are 5-10 variants available here and their choice is displayed in the preview right from the start so that you could make the right choice. Templates are really versatile and cause respect to web designers, who work on their development. You won’t meet such quality too often. Their structures and designs differ, all miniatures are filled with quality demo content. The work of the system web developers is really impressive. As opposed to Wix, the initial template choice is not final here. You can change it any time during the web design process. In this respect, Weebly ranks high. Wix vs. Weebly. Wix has a better choice of templates and it has Artificial Design Intelligence tool. However, they offer no value to those who want to get under the hood. Wix. Wix looks great, when it comes to the availability of SEO tools. Technically, it offers the same features as the majority of other website builders. These features are not better, but they are also not worse. The interface of optimization settings is very convenient and user-friendly. It is oriented on people, who don’t understand a lot about SEO. Each point comes with a short description regarding the data it should be filled with. It’s difficult to get lost here. There is a special master available for any website in the “Management”-”SEO-WIZ” section. This is the place, where you can complete several steps, which can help you optimize your website for the search engines after it is published (this can be done at once and at no cost). You can also manually set up SEO parameters for each page in the “Pages” category of the website editor. These parameters include title, description, keywords and human-friendly URL. There is also an opportunity to hide separate pages from the search engines, which may be quite helpful sometimes. What’s interesting, you can see the way your website will look in the search engines at once by activating the “search engine view” button. Weebly. When it comes to SEO, Weebly doesn’t stand out from the crowd. Actually, it’s difficult to stand out from the crowd by letting users fill out meta tags for web pages, unless you make this process more convenient by adding applications that make it possible to track the statistics of usage and traffic coming from the search engines by keywords. However, you won’t find nothing special here, except for standard settings. This, however, is also enough for effective website promotion. You can find Weebly SEO parameters in the following way: access the “Pages” menu, select the required point, activate the icon below its name and access the “Extra Settings” menu. This is where you can set up the title, description and keywords for the selected page. It’s not difficult. The process is standard. What you have to do is to select keywords properly and insert them into unique texts you’ll fill the website with. Then you’ll just need to wait. We also recommend adding your website to Google bars to boost the indexation of website pages. Apart from that, you can combine traditional methods of website promotion with popularization of your project in the social networks and well-known video hostings like YouTube. Traffic coming from these sources may be quite notable, which will result in the increase of traffic coming from the search engine results. Wix vs Weebly. Wix does not only restrict an opportunity of effective website promotion, but it also creates comfortable conditions for this process due to the properly thought-out and rich set of integrated tools. Don’t forget to apply for Google indexation after the website is published. This will boost the efficacy of the process. Weebly developers didn’t create any brand SEO optimization tools, but this will hardly have serious impact upon the promotion of websites at this platform. The essence remains the same: creation of semantic kernel for website pages, writing unique texts based on it and filling out meta tags. The website builder doesn’t set any restrictions to the realization of this approach. Wix. Wix support center is comprised of training videos, how-to articles and forum. You may also submit a ticket. Their Knowledge Center is huge and you can find answers to almost all the questions you might have here. I’ve tested their call back feature to check how quickly they react to user inquiries this way. Wix customer support team contacted me in around half an hour and that was really unexpected – great job! Weebly. The website builder offers a Support Center, Inspiration Center, free phone and live chat support. You can also contact one of their experts via using the email ticket. That’s exactly what I did. I’ve got an answer in 5 hours, which took me waiting for quite a long period of time. Weebly vs Wix. Both services offer enough support resources. Judging by my own test, Wix support team reacts to user inquiries much quicker than that of Weebly. If you really encounter problems during the web design process, this might be a real hindrance for you, which will prevent you from quick accomplishment of your project. Wix. For $0 you get a website with a pretty noticeable ad and a long URL like username.wix-dot-com/sitename. The lowest price version of Wix is $4.50/month. For that price you can connect a custom domain. The most expensive plan is VIP – $24.50 with yearly subscription. Weebly. Weebly’s pricing is simpler. There’s a free and four paid plans: Starter, Pro, Business and Performance. For $8 you can remove the ad and connect your own domain. The priciest plan is $49/mo. Wix vs Weebly. Personally, I prefer web services that offer simple price tags. Weebly is more clear with pricing plans. Besides, its advert is located in the footer and is very elegant (you don’t see it until you scroll down to the bottom of the page), while Wix places a huge screen-wide ad on your free website and what’s more, duplicates it in the right corner of the page. I don’t blame Wix for that – they’re free to place their ads anywhere. But compared to Weebly, that’s a bummer. wide selection of tutorials and interesting materials available in the Wix blog. a rich amount of half done and useless applications in the AppMarket. As to the rest of features, Wix works great. This is definitely one of the best website builders in any criteria and comparisons. It’s easy to deal with multiple nuances the system has. You can get used to the dashboard structure, choose functional applications with the lapse of time, wait for the moment when discounts and bonuses are offered and learn to use broad options of the website editor wisely. However, you won’t be able to increase website bandwidth. The only way out is to upgrade to a more expensive plan. From our point of view, this is a major disadvantage, which can be solved as you gain experience and skills. availability of the integrated app store. high cost of the eCommerce plan and availability of sales commission fees. Creation of an eCommerce website is not beneficial with Weebly because of the features described above. There are more affordable/suitable services for this goal. The app store deserves the attention only due to the amount of applications, but not to the assortment. As to the rest of features, there are no serious complaints about the website builder. As there are dog and cat people, there are Wix and Weebly fans. Those who want an eye-catching website, full creative freedom and aren’t concerned about the inability to switch templates in the future are likely to choose Wix. Those who expect a robust, reliable system will certainly benefit from the Weebly editor. You know what, take them both for a test drive. Wix seems more interesting and beneficial than Weebly based on the following parameters: functionality, template quality, convenience, cost. Weebly is positioned as the website builder used to create blogs and small online stores. It really doesn’t work well for other website types, considering high cost and availability of the strong niche competitor, which is Wix. The final result, however, looks more interesting when developed with Wix. We talk about user projects, not about theoretical editor features. Both systems come with attractive interface. They are almost similar in this parameter. As to the rest of features, Weebly doesn’t have anything to counterpose Wix, especially taking into account its higher cost. What’s more, you can pay for Wix plans around 50% less when using a discount. The difference is really striking. Weebly doesn’t have anything to offer in this respect – its prices are fixed and no discounts are expected. Generally, Weebly is more interesting for its fans, while Wix remains the market leader.